We order egg layers as day old peepers every 6 months. Things just happen to the girls and we regularly need reinforcements. Since our hens get to keep their beaks, we use old breeds and never give any growth hormones we prefer to start them as day old peepers in our own brooder. The other thing about chickens is a flock will establish a pecking order. 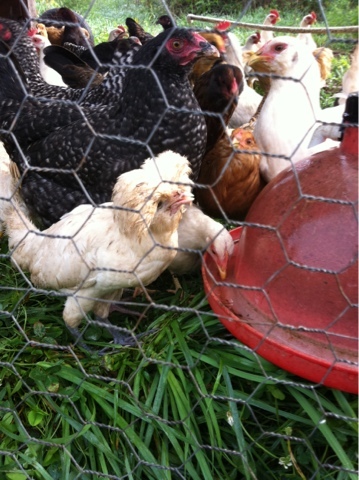 One hen is the hen everyone picks on, pecks at, excludes from the food and roost whenever possible. If the bottom bird is removed from the flock the flock picks a new bird to be the bottom of the pecking order, to be hen pecked. If we tried to introduce new birds into a flock the new birds would get beat up badly. From beginning to end the flocks are together. Right now our youngest flock is 5-6 months old. They were ordered as a "fancy egg layer assortment", which means this group varies widely. A hen like this, a Polish with the feather topping on her head, would certainly be a target if introduced at this stage of the flocks development. Because they all grew up together she is not the one they go after. But she does look like she could use a wash and comb out.